Amid a spike in hospital visits for suspected synthetic drug overdoses, D.C. hospitals will now do blood and urine tests on anyone who appears to have taken the dangerous drugs. 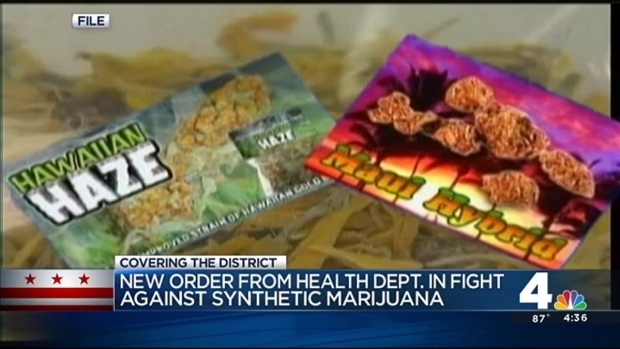 The emergency rules that went into effect Monday require hospitals to collect blood and urine samples from patients who "present and have symptoms consistent with having taken a synthetic cannabinoid," the D.C. Department of Health announced Tuesday. The samples will be turned over to the Office of the Chief Medical Examiner for testing, DOH said. D.C. hospitals are now required to collect blood and urine samples from patients suspected of using synthetic drugs. News4's Tom Sherwood gives the latest updates on how the District is handling the drug problem. The U.S. Attorney's Office for D.C. held an event Tuesday night at the Central Union Mission men's shelter in D.C. warning about the dangers of synthetic drug use. Residents of multiple homeless shelters told News4 people come from across the region to buy synthetic drugs near shelters. "All parts of the city, they're coming here to get the K2," shelter resident Hollis McDade said, referring to the substances called names including K2, Scooby Snax and spice. Synthetic drugs emerged in Europe in 2005 and then in the United States in 2009, according to a 2013 report by the Centers For Disease Control.